Jesus tells us that the demon is the prince of this world. And the battle with the evil one is a constant struggle. For if we didn't have God to withhold the devil doing evil to us the tortures we would endure by the devil would be UNIMAGINABLE. There is two types of torture that the demon can deliver, torture of the flesh and torture of the spirit. Those that were already bound for hell would be killed first, for the demon already has a firm claim on their souls. Those souls that are bound for heaven or purgatory, would be tortured in the flesh and in the spirit to such a degree that they could not bear it. Without God's intervention souls that would endure this suffering at the devils hands would deny God in order to alleviate their suffering. Saints were burned at the stake, and tortured horribly before death, but NEVER denied God. God allowed this suffering, for the good of their souls or the souls of others. This is a mystery which we, cannot comprehend. But God alone is the final judge on when life and suffering ends. Think about this. Right now God Himself is holding back the devil from inflicting the evil upon your head that he so desires to give you. As you go about your tasks everyday the love of God surrounds every heartbeat and breath, protecting you from the evil one and guiding you on the path to Him. From conception to natural death, we are under the love and will of God and life should not be prevented or ended by any means other then what God wills for it. But are we actively engaged in the fight against the evil one? Do we realize that souls go to hell daily and what we, as Christians, can do to assist our lost brethren to keep them from hell and lead them to God? For if we truly love God, then we love those that He loves, which is all the souls on the earth, including those that are the farthest from HIM. Atheists, Satan worshipers, those that do you evil... ALL. For if we make an oblation of a heart that loves God, how can God deny a heart that loves Him so? Such a heart that beats only for Him will do much prayer, fasting and penance for those souls that God loves and desires not to be lost. The farther a soul is from God the more right it has to God's mercy. So are we participating in daily sacrifice that leads souls to God? For "Amen Amen I say to you that no slave is greater than his master nor any messenger greater than the one who sent him." John 13.16. For it is in humilty and lowness that the battle against the evil one is raged.... and won. At first it is fearful to engage the evil one, but as time progresses, as you continue in your prayer, purification and penance, you will realize that the demon, no matter how he shows himself to distract you from your task for souls, is nothing but a gnat that unfortunately must be endured while in the flesh. One cannot battle the evil one for souls if he himself is "tepping" (associating) with the devil. First go to confession, with a firm resolve to change your life in line with the teachings of the Church, otherwise you are encamped with the evil one and useless in this battle. You must pick sides, are you with the devil or the King of Kings? This is no joke. Jesus's sacrifice was not a lark. He looks at you and says, "Choose." You cannot go to Holy Mass on Sunday and be disobedient or steal, or take into yourselves that which is unholy. (Every really listen to what is said on some of those t.v. programs?). For obedience is the path to God. Only purified souls can take up the standard of the Lord to battle the evil one. Purify yourselves and join the fight! Souls fall into hell every day and they ARE worth fighting for! 2. Holy Mass. The best defense against the devil is the Holy Mass daily, for it is difficult to take up this standard without the Holy Eucharist daily. The Holy Mass is the strongest weapon against the evil one and since the evil one does not sleep we should arm ourselves DAILY with the Holy Eucharist. 3. Being obedient to those that are over you, even in the littlest things. For obedience is the path to God. 4. Expelling from your life what is not of God and taking in what is of God, scripture daily, holy books, life of the saints, etc. 5. 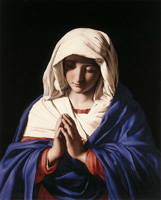 Rosary daily... preverably ALL mysteries if possible. 6. Humility. Submit in humility to God in all things. Pray the Litany of Humility daily if needed. If you do the above, be prepared for what God will show you, for your eyes will be opened. Jesus it is love for you, love for your Sacred Heart, love for the Immaculate heart of Mary that I offer this (say offering - rosary, penance, etc) for the souls that you love, especially those that are in most danger of hellfire, and I beg the conversion of sinners.